Rhytidectomy, also known as a facelift, can help enhance the most unmistakable indications of maturing by extracting fat, tightening underlying muscles, and in addition reviving the skin of the face and neck. Men in Los Angeles and Beverly Hills may consider facelift surgery trying to look more youthful and seeking to recapture their morale. Taking a moment to consult with a plastic surgery specialist will give you the details and information you need to make your decision. Men who choose to have a facelift are commonly looking to succeed further in the workforce, recapture their youthful appearance or try to match the same youthful appearance as their significant other. Men looking to treat indications of aging in the temples, eyelids, and mid-face territories can incorporate their facelift surgery with a forehead lift and/or eyelid surgery. Additionally, facial inserts, injectables and/or skin restoring can work to upgrade the results of a facelift system. Dr. Steinbrech offers the majority of his male patients in Los Angeles and Beverly Hills the best procedures suited for each individual to achieve the look they desire. 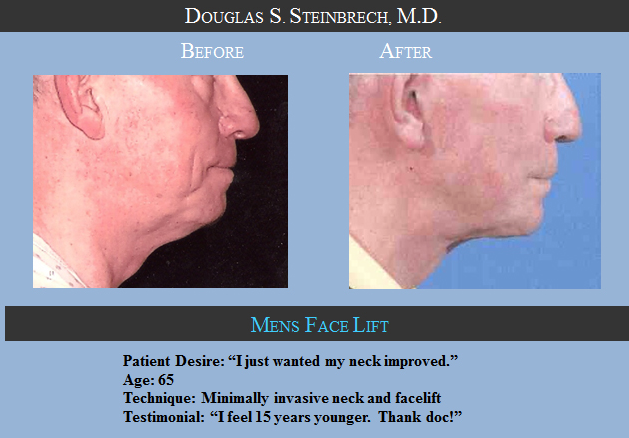 View before and after photo of a face lift procedure performed by Dr. Douglas Steinbrech. 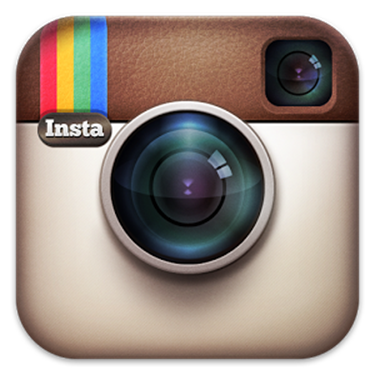 What is the Procedure of a Facelift? Traditional facelift: The “full” facelift for reviving the face, neck andcheeks, including fat chiseling, lifting and re-situating of muscle and deeper tissues, skin trimming and re-fitting. The entry point starts at the temples and ventures out down to the front of the ear, around the ear cartilage, and behind the ear to the lower scalp at the hairline. At times an alternate cut is made under the chin. Limited-entry point facelift: For defined restoration around the eyes and mouth, including nasolabial overlaps and other profound wrinkles. Short entry points are made around the ear and at the temples, and conceivably in the lower eyelids and/or under the upper lip also. Neck lift: A neck lift focuses on cheeks, detached skin on the neck, and fat under the chin area. The cut is made around the ear lobe and behind the ear to the lower scalp. In every one of the three strategies, entry points are repaired with sutures or tissue paste. Scars are shrewdly set to be covered up in the hairline and in addition the regular shapes of the face. What Should I Expect During My Facelift Recovery? After your facelift, your plastic surgery specialist will wrap the entry points in wraps and may put waste tubes in the zone. The tubes will be taken out the following day and your hair will be washed. On the off chance that surgical cuts are utilized to hold the entry points shut, they will be extracted one week after the facelift. From the start, you may encounter swelling, dullness, wounding, and an inclination of constraint or strain in the face and neck. Your face may look uneven or twisted, and your facial muscles may feel solid; all normally resolve 3-6 weeks after the facelift. Sensation ordinarily comes back within a couple of months. Scars get to be less red, raised, uneven or bothersome in time. Patients in Los Angeles and Beverly Hills may return to their regular routine about 3 weeks after their facelift surgery. Patients should take precaution when they need to shave behind the neck and ears where the scars from the entry point are located. Gently shave the whiskers around the incision points until your skin has fully healed and no longer feels sensitive. Will Facelift Surgery be a Good Fit for Me? During your consultation, Dr. Steinbrech will discuss whether a facelift is right for you and if there are any insurance coverage options. Today is your first step towards making a decision to have a facelift. Call today for more information about facelift for men in Los Angeles, please call 310-774-4034 or fill out the contact form to set up your no-obligation facelift consultation today.